Even the best wood floors are subject to problems. For starters, because most hardwood flooring is relatively soft, it is more likely to scratch than other flooring. There is no easy way to avoid surface scratches and gouges. They’re the inevitable result of daily wear and tear. 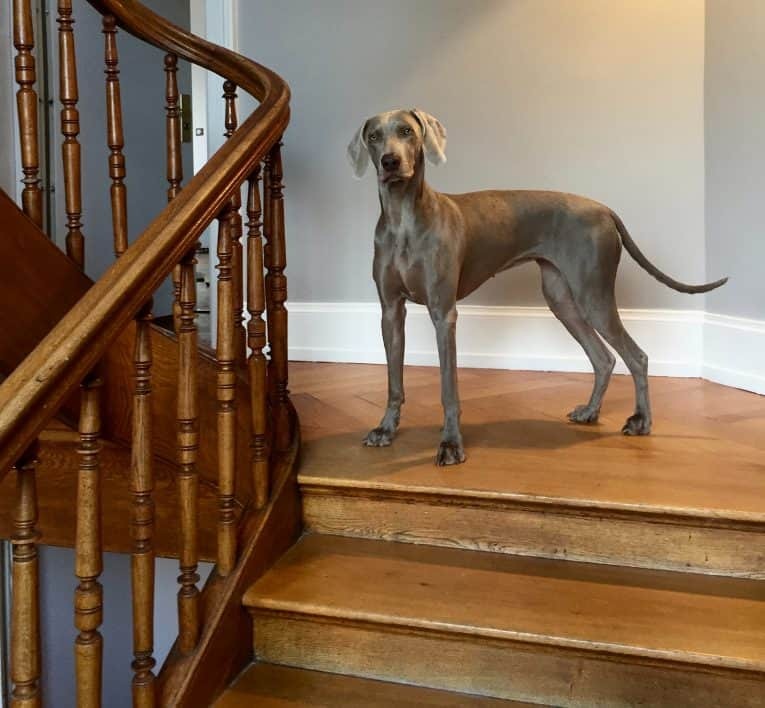 With hardwood flooring, scratches are inevitable…especially if you have a dog. Below we show you how to repair minor scratches and gouges. If your floor has many scratches or gouges, it’s probably time for floor refinishing. The cost of refinishing a hardwood floor will depend upon the condition of your floor, the type of wood flooring, and the number of square feet to be refinished. Refinishing a wood floor is a big job that involves moving furniture, bringing in a drum sander or other floor sanders, protecting the rest of your house from dust, dealing with odors from polyurethane or other finishing products, and more. Because it’s easy to ruin an expensive wood floor, refinishing a hardwood floor is often best left in the hands of flooring contractors. You can’t easily prevent problems caused by expansion and contraction. Wood, as a naturally fibrous and porous material, expands and contracts with changes in temperature and humidity. As it does so, boards can separate or warp and nails can loosen. With expansion and contraction—and movement in general—hardwood floors can develop squeaks. For methods of fixing squeaks, see How to Fix Floor Squeaks. The natural settling of a house can also cause separations between the joists and the subfloor. If your floor is sagging or uneven, there could be a serious structural problem causing it. 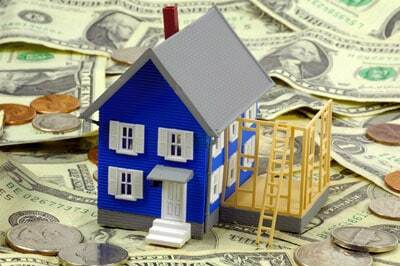 If this is this case with your home, consult a contractor. To maintain wood floors, vacuum or dry-mop them about once a week. In general, water is an enemy to wood floors. It can damage the finish, leave rings or discoloration or—at its worst—cause flooring boards to cup, warp, buckle, or grow mold. 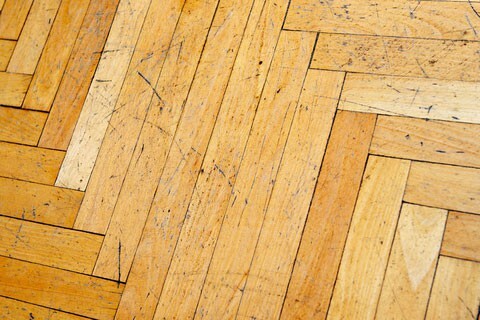 Water damage to hardwood floors can be from minor to major. It can be caused by a potted plant that leaks onto the floor, from a burst appliance supply hose, or from major flooding. Methods for dealing with hardwood floor water damage depend upon the severity of the damage. Severe water damage. If several hardwood flooring boards have warped because of excessive water damage, they’ll probably need to be removed and replaced. In many cases, you can replace only the damaged areas. In order to do this, you’ll need to be able to identify and buy identical replacements. Of course, this isn’t always possible. Removing a water stain. If someone has left a water-mark ring from a hot coffee cup or cold glass on the floor, you might be able to extract the stain. Fold a white cloth or rag in half and lay it over the stain. Then set an iron to medium heat and use it to iron back and forth over the stain area. Do this gradually, checking frequently to see whether the stain is disappearing and to make sure you don’t cause further damage. Larger stains on wood floors are typically water marks, caused by spills or over-watering house plants. The area must be sanded, sometimes bleached, and then refinished to match the rest of the floor, which is the trickiest part. It’s a good idea to hire a flooring contractor for this work, particularly if the stain is in a highly visible area. 1 Sand the area with a vibrating sander, first with 100-grit sandpaper and then with 150-grit. 2 Vacuum the area with a shop vacuum. 3 Wipe the area with mineral spirits for an oil-based stain and water for a latex stain. 4 For a dark stain, apply bleach or an oxalic-acid solution to lighten the stain, and then lightly sand with 150-grit sandpaper. 5 Mix up a stain to match the existing floor color. This process usually requires testing possibilities on a piece of wood that’s the same species as your floor. If you can’t find replacement pieces, cut them from a closet or another inconspicuous part of your existing floor and then replace that cutout with newer flooring. Minor scratches in wood floors often can be buffed away using steel wool or hand-sanding with progressively finer sandpaper grits. When sanding minor scratches, restrict your sanding to the scratched area, feathering only slightly into the surrounding surface. Always sand or buff only in line with the wood grain. Extensive scratches in wood flooring generally calls for a sanding and refinishing. Polyurethane finishes are difficult to sand. Try using a scouring pad dipped in mineral spirits or use a sanding screen. HomeTips Pro Tip: Don’t ever wax a wood floor that has been coated with a polyurethane finish—this will make it impossible to recoat in the future without having to sand the floor first. If paste wax will adhere to the finish, you can use it to hide scratches, and the wax is available in clear, honey tone, or brown to match most any wood floor. Wood-repair wax sticks may help to fill deeper scratches and dents. You can sometimes raise small dents by placing a few drops of water on them and allowing the wood to swell back to its original shape. Applying mild heat with an iron on a thick cloth or a heat gun helps this process along. For deep gouges or dents, you can use a wood floor filler and wood stain to repair the damaged area. Before applying the filler, tape off the damaged area so you don’t accidentally apply filler where it doesn’t belong. Mix equal parts of the epoxy-based filler and apply to the gouge with a putty knife. Allow to dry. Then sand and finish. The following video by Russ Richards shows exactly how to do this. Note how he mixed two different finishes to achieve the right color. You can buy the wood floor filler he uses, Elmer’s Damaged Wood, on Amazon. Badly damaged or rotted sections of flooring must be removed and replaced with new pieces. 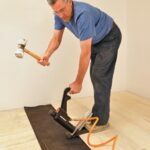 This involves cutting out or prying up a section of the finish flooring, gluing or nailing replacements to the subflooring, filling cracks to match, sanding the surface, and refinishing. If you’re not experienced with this type of work, you’ll find the most difficult part is getting the new pieces to match the old. This job is usually best left to a wood-flooring professional.